Since sequels are almost entirely dependent on box office for their existence, it’s nice when quality comes along for the ride too. ‘How to Train Your Dragon 2’ is a welcome example, and does its best to capture the things that were good about the first iteration and build on them, taking them to new avenues and being much more than a child-only romp. Indeed, it’s a solid mix of over the top humour, good action sequences and plenty of stunning CGI scenery that dazzles the eye in to the bargain. Jay Baruchel’s American drawl is welcomed back with open arms, and he plays Hiccup with just the same level of charm and light humour as he does in the first, his chemistry with America Ferrara’s Astrid and Gerard Butler’s Stoick being just as effortless as it was before. The most important chemistry however is with his dragon Toothless, and their scenes together can move from amusing to emotionally resonant with ease, something that could easily go wrong when animated creatures are involved. It’s to the film’s credit that Toothless has such a strong identity despite this, and that’s one of the main strengths of the film, though Craig Ferguson’s always entertaining Gobber cannot be forgotten either. New plot devices courtesy of A-list additions Kit Harington and Cate Blanchett work to varying levels, Harington’s character being fairly wooden but gradually being worked in to the strong script and interacting well with both Baruchel and Ferrara’s characters, while Blanchett puts in a performance that’s packed with emotion and intensity but suffers a bit because her inexplicable attempt at a Swedish accent is highly suspect. Why she has to sound Swedish is anyone’s guess, since everyone basically sounds either Scottish or American, but Blanchett does what she wants. Luckily, the extra dynamics that the characters add do work despite their flaws, so her accent can be forgiven, eventually. Djimon Hounsou’s villain is a mixture of menacing and annoying, often delivering lines that drip with malice but also shouting so often that you feel his main way of intimidating his foes is to go “BLAAARGH!” right in their faces. Perhaps expecting true depth from a villain in a film such as this is asking too much though, and he is probably scary enough to frighten the kids that flock to see it. Despite his predictability though he does definitely add to the experience, and the film is good enough that you don’t focus on his shortcomings too often. 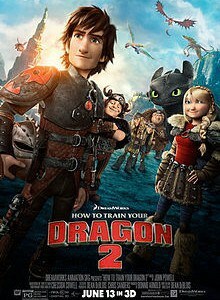 ‘How to Train Your Dragon 2’ is a success of a sequel that has universal entertainment value and provides a fun 102 minutes for any fan of dragon-frolicking fun. While it shows glimpses of being a true animated masterpiece that it doesn’t quite live up to, it must be commended for its success at keeping the bar high and ensuring that everyone awaits the third film in the franchise eagerly.